I have determined 2016 to be the year I rage against the stuff. Sometimes, I feel like we focus more on stuff than on life itself. And I'm over it. I've moved to a capsule wardrobe, downsized my make-up collection, and it's even manifested itself in how I gift. The only thing not affected is my shoe closet. That's not going anywhere. This week, I'm focusing my blog posts on gifts you can make and alternatives to buying more stuff. Just in time for Christmas in a couple weeks! Spoiler alert - nothing about this post is healthy. A few years ago I stopped buying our friends gifts and started making them food gifts such as cookies and homemade jelly. Most of them even return their jars every year, which is much appreciated! This has grown from just our friends to our neighbors and now even our co-workers! 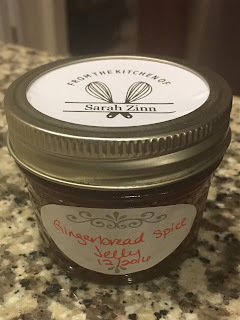 It's such an easy idea that I thought I would share my favorite jelly recipe to make - Gingerbread Spice Jelly. You're probably thinking that canning is something your grandmother did or that it's much more complicated than you can handle. Preserving it's having a moment. At least in my world it is. It's actually pretty easy and awesome. I started canning because a) I grew up with women that canned and they won't always be around to make me pickled beets and sweet pickles and b) I once had a job that I could control nothing and this became my outlet. 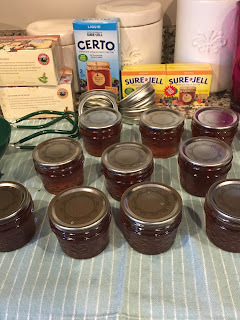 I started canning with the sole purpose of learning how to make pickled beets (because those in the store are disgusting), but found that I loved making jams, jellies and fruit butters. The first year I canned, I did a lot. I made way too much and we didn't eat all of it. Then I started making jellies as gifts. 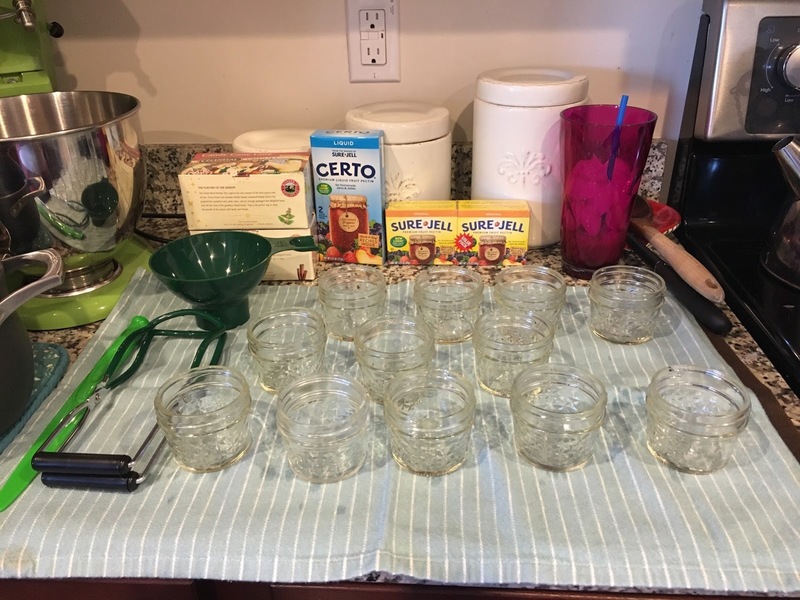 I made each family a full half pint jar and some other items and it was too much! Too much work and too much jelly. I finally found my happy place with 4 oz jelly jars. You can make a ton using the smaller jars and it turns out that's about as much as people want! Before you get started making the jelly, you need a few items. Most can be found in your house! Pot for making the jelly. This needs to be at least 4 quarts or more. 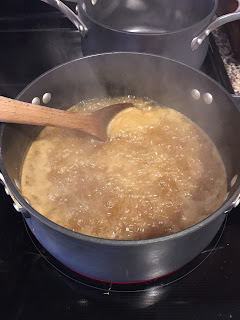 I use my 5 quart soup pot or an 8 quart stock pot for the fruit jellies that bubble up a lot. This recipe doesn't bubble much at all so you can get away with a 4 or 5 quart pot. Large stock pot for processing the jars. I have a pot I use specifically for this, it's a 16 quart stock pot. I prefer a wider pot so that I can use my round cake rack for the jars, but a regular stock pot works as well. It just depends on how many jars you are trying to do at one time. Basket or rack for the jars to sit on. You want the jars off the bottom of the pot so the air/water can flow freely around them. I use a combination of a basket from a canning starter kit and a 9-inch cake rack. Funnel, jar lifter, and lid lifter. 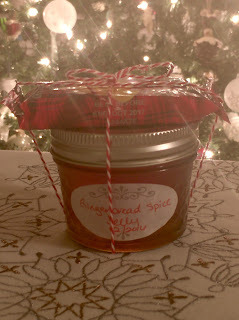 These you can get in any of the canning sets, like this one. Ladle, wooden spoon and slotted spoon. Jars. If you follow the recipe, it's 5 half-pint jars. I use 4 oz jelly jars and usually get around 11 jars worth.Always prepare an extra jar or two just in case you have extra! Once you have all that, you can get started! When it comes to canning, I don't mess with recipes. There is one that I'm going to actually experiment on this weekend, but that's pretty rare. Home canning and preserving is not something that you really want to play around with. You know, botulism and all. Thankfully, this recipe is pretty easy and doesn't have any fruit in it. It is straight from Taste of Home and I'm not even going to alter it. 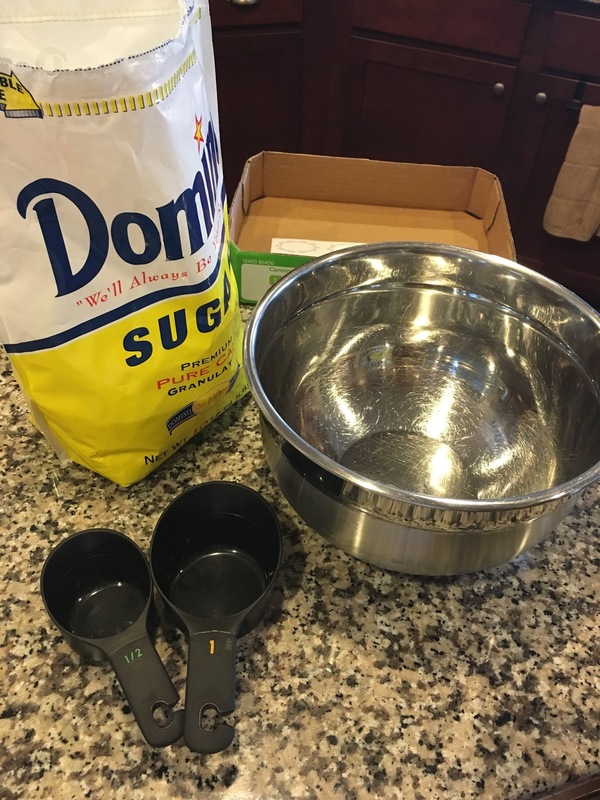 Here's the ingredients, then we'll get to the step-by-step. This recipe makes 5 half-pint jars or about 11 4-oz jars. If you are new to canning, I recommend you head over to my favorite canning site, Food in Jars, and read about processing. 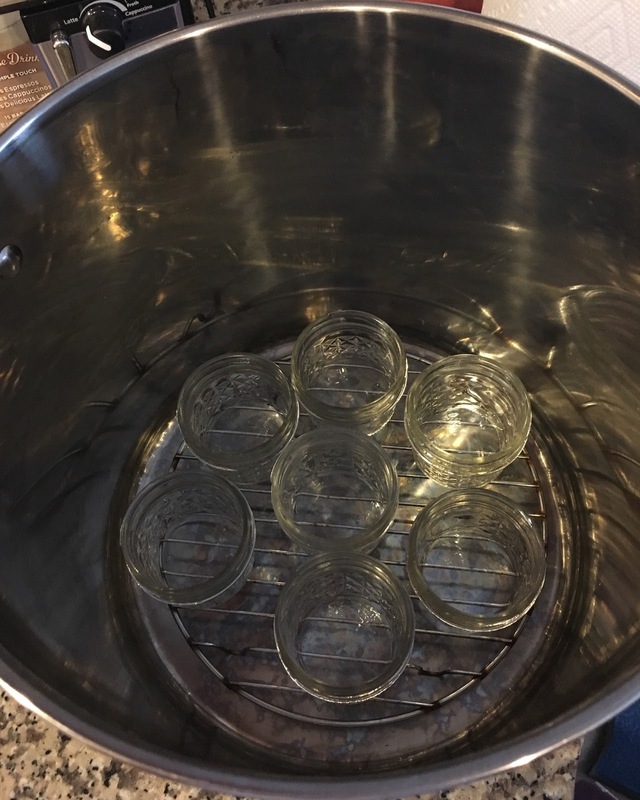 Her post, Boiling Water Bath Canning is a great tutorial on how to process the jars. I used her book, Food in Jars, and her site to teach myself how to can. Before I do anything else, I go ahead and set up my jars in the pot for processing, cover them in water and start heating them up. It takes a long time to get all that water boiling and this helps sterilize the jars. 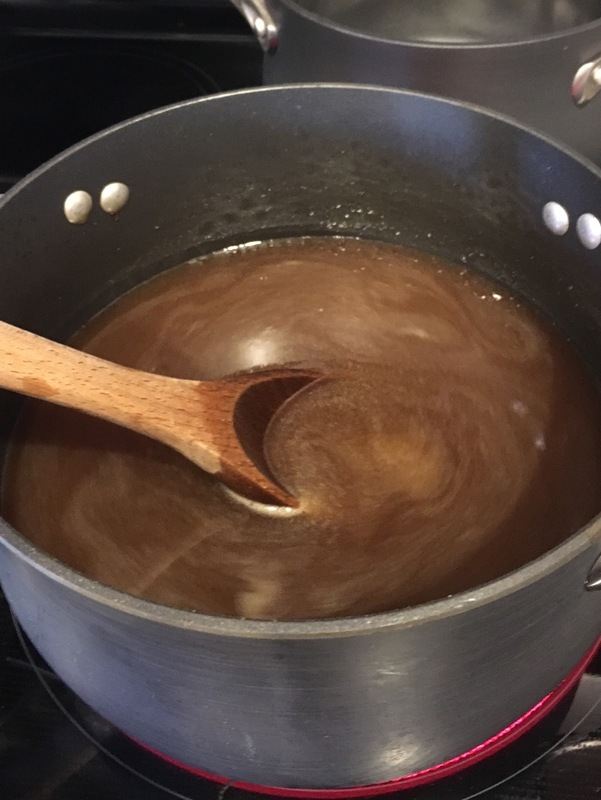 In your pot for making the jelly, bring the 2 1/2 cups water to a boil. 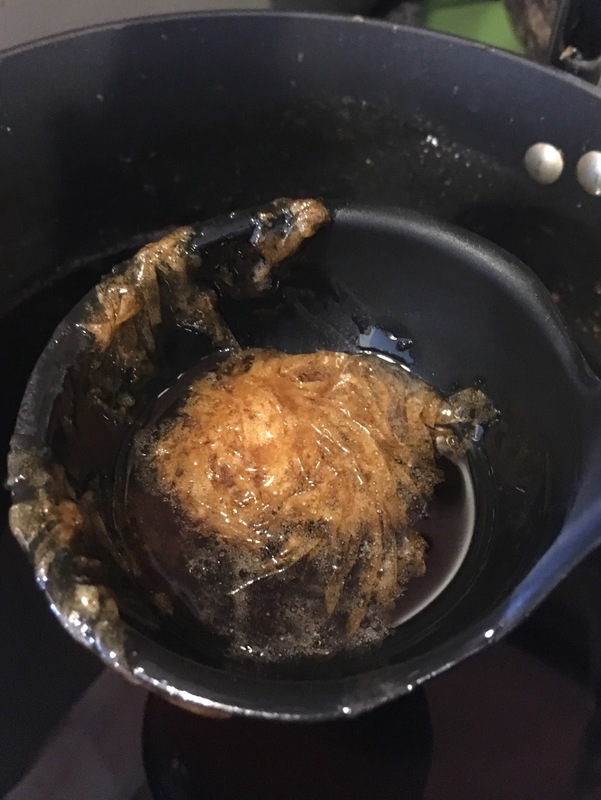 Remove from heat, add the tea bags, cover and let steep for 30 minutes. While the tea is steeping, I like to go ahead and measure out the sugar, the apple juice, the butter and get the pectin ready to go. In my experience, jelly goes from 0 to 60 in about 30 seconds and there is never as much time as you think. Also, if you are making multiple batches of jelly, make sure to buy your sugar in no less than 10 pound bags. You'll thank me when you aren't running out every other batch. 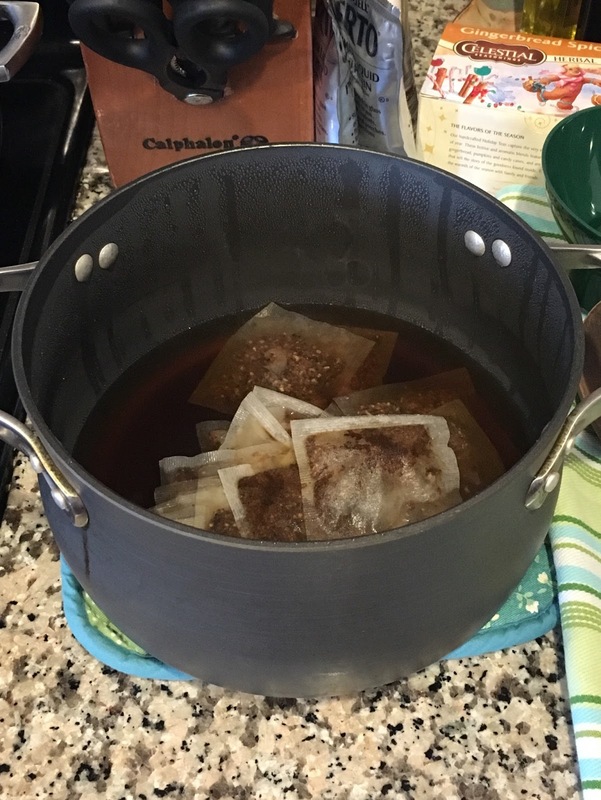 Once the tea has steeped, remove the tea bags with the slotted spoon. I like to drain the excess water out of the bags when pulling them out. Discard the tea bags to the trash. Add the sugar, apple juice and butter. Bring to a full rolling boil over high heat, stirring constantly. The mixture will go from the butter being in pieces, to a luxurious brown liquid. Once you're at a full rolling boil, add in the pectin. Boil for 1 minute, stirring constantly. This is what a full, rolling boil looks like. Remove from heat and then skim off the foam. This is why you skim off the foam. Ick. 3. Remove the jars from the pot and fill them. The pot with the jars should have boiling water at this point. Pull the jars out with the jar lifter. 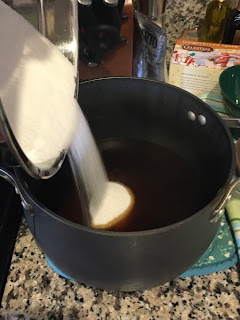 Once the foam has been skimmed from the top of the liquid, ladle it into the jars, leaving 1/4" head space. Lids on, ready for bands. Wipe the rims, apply the lids and screw the bands on fingertip tight. What that means is that you screw the bands on just tight enough to hold the lids on. You don't want them as tight as you can get them, just tight enough to hold the lids in place during processing. Put the jars back into the pot for processing. Make sure all jars are completely covered with water (some might have evaporated). Bring back to a full boil and process for 10 minutes. Remove jars from the pot and let cool. You should start hearing the glorious sound of popping. The popping signals that your jars have sealed and are good to go. A final test for sealing is to take the bands off and lift the jar by the lid. The lid shouldn't come off. If it does, it's not sealed. Any jars that don't seal, put them in the fridge. In years past, I have gotten super creative trying to wrap these babies, but this year has been my favorite. I simply added a label for the jam, a round label with a stamp that says "From the Kitchen of Sarah Zinn," a package of shortbread cookies and some baker's twine. Sometimes, less is best! Canning and making jellies is truly one of my favorite things. I love making it, I love eating it and, most of all, I love gifting it. I tell people all the time that my love language is food and it's true. I show my love by feeding people and canning is just one more way to do that. What about you, what are some of your favorite food gifts? And, have I convinced you to try canning? That jelly sounds absolutely delicious! I love the idea of making gifts rather than going out and trying to buy the latest and greatest. I need to incorporate more of this into my holiday routine. What a wonderful idea.I think homemade gifts are the best gifts to get. I love making jelly. It's so much fun! I also started making homemade gifts for friends and family a few years ago and not only is it much more fun for me, but it's more meaningful for them. This gift sounds easy and delicious -- I would totally make some for myself!